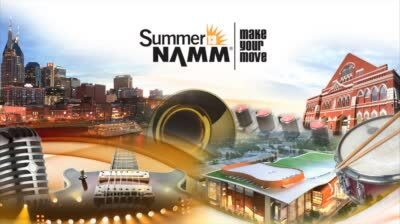 Exhibiting at Summer NAMM gives your brand visibility among independent dealers, corporate buyers and music enthusiasts. Our mid-year gathering in Nashville sets the scene for buyers to get a fresh perspective at Retail Boot Camp, proactive dealers to be honored at the Top 100 Dealer Awards and the public to enjoy a sneak peek of what's to come in music products retail stores. Take your reach further with these smart options for online and mobile marketing. The NAMM Exhibitor Portal helps you promote your events and artist appearances, market your brand to buyers, post your press releases and increase traffic to your booth. As an exhibitor, you receive free listings for your events and artist appearances on the portal, which you can connect with on the NAMM website, as well as on the 2013 Summer NAMM Smartphone Application. You'll have access to your own information, so you can update it as needed. NAMM exhibitors can access to NAMM’s Virtual Press Room at namm.org to upload one PDF file of up to 128 MB that includes press releases, product photos, press kits and other promotional materials that you would like to make available to media during the show. Just click on the “My Press Kit” on the left-hand side to take care of business—unlike the old USB drives distributed with information, the Virtual Press Room gives exhibitors and their public relations representatives the freedom to make changes, revise or add materials for their company all the way through the show. Prior to the NAMM Show, all registered media will be directed to NAMM's Virtual Press Room for all of the show-related materials they might find of interest. For additional information about how to log on to the site, visit www.namm.org/faq. If you have further technical questions, send an e-mail to info@namm.org. NAMM offers two sponsorship options for exhibitors wanting to get maximum exposure for their company during 2013 Summer NAMM and reach the most important buyers and decision makers as they are making their purchasing decisions. Upload enhanced company and product information for buyers to access easily. Plus, add your logo so it stands out on the map, in the show smartphone app and in the online Directory on the NAMM website. To take advantage of this option, visit the "My Booth Description" page (under "Promote Your Booth"), scroll to the end of the page, select the option to purchase an enhanced directory listing, fill in your credit card information follow the steps to add your company description to the online Exhibitor Directory. Note: You must be signed into namm.org and be a designated contact with a company exhibiting at 2013 Summer NAMM to view this page. This option is just $25. Get your company and/or product information featured prominently in rotating banner ads that visitors can click through to access your company's landing page, find your booth, contact you directly or access your company's product information. To take advantage of this option, download the Sponsorship App now. Banner ads are $250 each. By sponsoring a display case in the lobby of the Nashville Music City Center, exhibitors can highlight new products or put the spotlight on existing gear. This additional space allows you to increase your visibility among the global audience of buyers and decision makers as they enter the show looking to discover new brands and expand their inventory. An exclusive display case is $550. Please call your NAMM Business Partner at 800-767-6266 or e-mail your request to tradeshowsales@namm.org.